These are my sketches from Week 3 of the Life Drawing class at work, this time with a female model again. I think the overall standard of my quick gesture-drawings took a set-back again this week, but there were some better ones which I believe resulted from my experimenting with different methods, such as using the line-of-action and shoulder/hip lines as a key element in planning the sketch. In hindsight I think my still-emerging overall pose-planning skills first tentatively showed their head in this session. This was my favourite drawing from the session, resulting from an exercise in which we had 8-12 minutes to draw each vertical third of the body. Although not a complicated pose, I found that I was able to capture the anatomy and tones of the body to an acceptable level. These are my sketches from Week 2 of the Life Drawing class at work, this time with a male model. I think I was feeling more settled into Life Drawing this week, and felt more calm and focussed when doing the quick gesture drawings. I was still struggling to see the model as a whole, and approach my sketch with an overall plan / design in mind - but at least I was practising with this aim in mind. This was a left-handed drawing exercise, I think designed to help us loosen up and enjoy ourselves a bit. I like the pose I achieved in this quick-sketch, in which I felt I was getting somewhere - especially when compared to the quick-sketches from Week 1! These are my sketches from Week 1 of the Life Drawing class at work. Having never done life drawing before I was on shaky ground, evident in the quick sketches more than the slightly longer ones. Even on the longer poses I felt that I was focussing too much on copying the lines and shapes I saw, rather than actually 'feeling' the pose or seeing the illustration as a whole. Still, I was sufficiently pleased with this first sketch that it took the edge off the shock of the poor quality of some of the others! ... and here are those dreaded quick sketches - each took about 30 seconds, and my inexperience shines through! Welcome to my art page! My passion for visual storytelling is driving me to improve my drawing and painting skills, which have been left sorely neglected for years! I'd love to one day write and direct make my own animated films, and so it seems like a reasonable first step to improve my drawing skills so that at least I can at least communicate my ideas effectively to real artists! 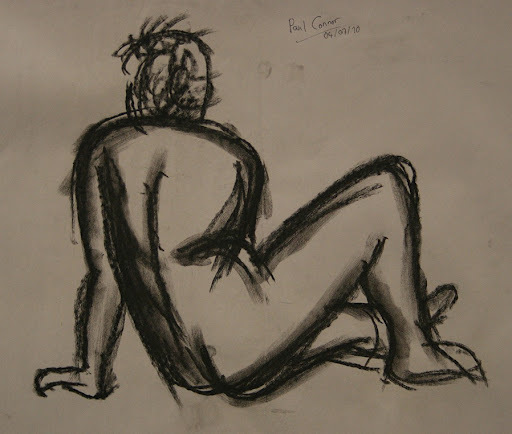 I've started by taking up Life Drawing classes held on Monday evenings at work. Although initially in doubt about my skills, I have improved enough over the last 5 weeks since starting that I feel I'm on target to some level of mediocrity! Perhaps there's hope yet of my one day becoming a concept / storyboard artist? !